Aftercare was sublime!! As are the pickups! I was bought these pickups by my good lady, who lost the instructions... I almost got it all correctly wired but had no volume or tone controls. Looking at the video it shows a circuit board between the knobs with a wire going to selector switch. I did not have this and instead had 2 wires I was unsure of how to hook up. I emailed EMG and A nice man, Eric Roach replied asking for a picture to help him figure out the issue. Once I sent the pictures I received a reply explaining exactly what goes where and now the pickups are installed properly I could not be happier. I feel that Eric deserves a pay rise as he was superb in his timely assistance of myself. And these pickups ROCK!! Love them!! These pickups are exactly what I was looking for. They make my Mexican Tele scream clarity and tonality. The neck pickup is my go to on the clean channel, and the bridge on the drive/overdrive channels. I didn't loose the "Tele sound" on either pickup clean or driven. My favorite part is being able to hear every string clearly when the guitar is distorted, no matter what amp/pedal I am using. 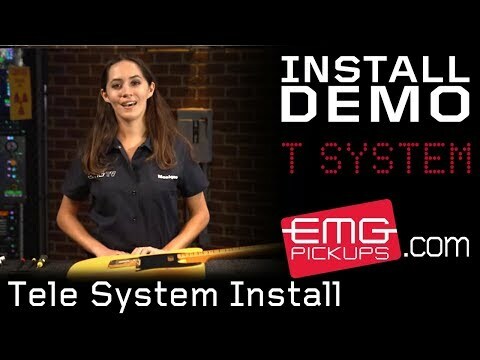 If you want to Improve your Telecaster these are absolutely the pickups to buy. Installation was very easy. You will have to modify your pick guard and bridge pickup holes (because the EMG pickups are slightly bigger). Other than that it only took my an hour because I am a perfectionist. Great buy, thank you EMG for making these pickups.